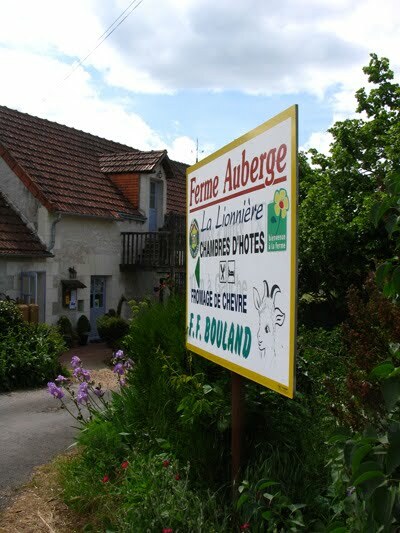 For the second year running the SCI Les Huîtres Pétillantes held their annual lunch at the Ferme Auberge La Lionnière in Mareuil. As it was Mothering Sunday (Fête des Mères) the Menu des Fêtes was served (25€). We started with a very tasty salad of lettuce and duck gesiers with a fromage de chèvre 'pakora'. Then a choice of terrine maison or tarte aux fromage de chèvre. For main course we all had the tender young goat in a mustard sauce. Then a couple of goats' cheese and for dessert either a chocolate sponge or a strawberry one. The only disappointing course here is the dessert as the rest of the meal was very flavoursome as always. The wine list only has wines from the commune of Mareuil, so after the Kir, which is included on the menu, we had the 2008 Gamay from Clos Roche Blanche. 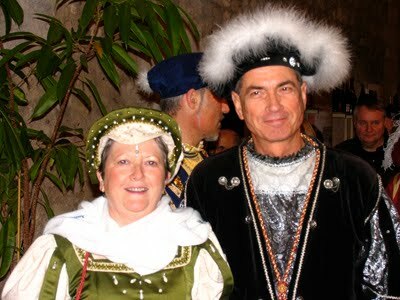 Frédéric et Françoise Bouland, who run the Auberge, are good friends of Catherine and Didier at the Clos Roche Blanche. The 2008 is showing very well with soft, opulent black fruits particularly when drunk on its own or with the gesiers salad. Interestingly with the paté the Gamay's acidity became more apparent. 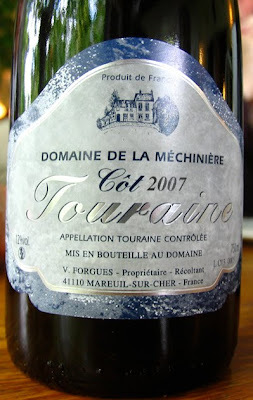 This 2007 Côt changed character quite considerably over the course of the meal. Initially tasted on its own it was very much in the line of 2007 with edgy fruit, quite marked tannins – a character of Côt – and light to medium weight. The terrine and the goat smoothed out the wine out. Then with the goats' cheese the Côt became much richer and more mouthfilling. 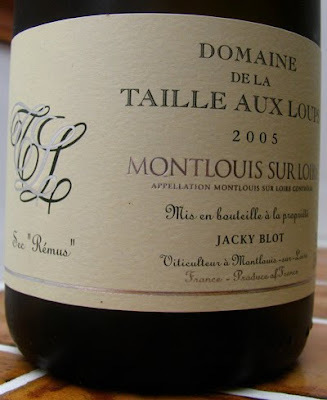 Last night we had a bottle of the 2005 Rémus, Jacky Blot's top dry Montlouis as an apero. This Rémus reflects its year with its rich fruit and relatively low acidity. It lacks, however, the tension and precision that is apparent in the 2007s and 2008s, which will need time to shown their best. The 2005 is more a crowd pleaser – nothing wrong in that but long term I fancy the 07 and the 08 will often prove to be the better wines. This illustrates, I think, the difficulty of trying to classify the overall quality of Loire vintages because of the diversity of wines made. By general consent 2005 is a very good vintage for reds but it is not necessarily the top for dry whites because the hot weather that is likely to produce a good red vintage may well not be ideal for dry whites either from Chenin Blanc or Sauvignon Blanc. Here the varieties are better served by the long, slow ripening cycle of 2008. 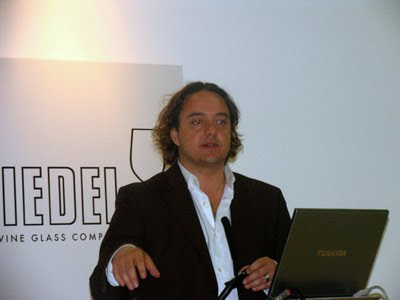 Equally, although the sweet wines of 2005 are attractive again they don't have the thrilling purity of 2007. In contrast 2007 reds are well below the level of 2005. Given the difficulty of remembering the quality of vintages around the world it makes sense that people look for a short cut, so the attraction of a quick global assessment of a region is understandable. I am, however, increasingly aware that this does not really work for the Loire. Last night we had a very good takeaway beef and olive tagine from Nacer@le Lézard Vert. Firstly a bottle of Jacky Blot's fine Triple Zéro to get the six of us gathered for our group's AGM in the right frame of mind. 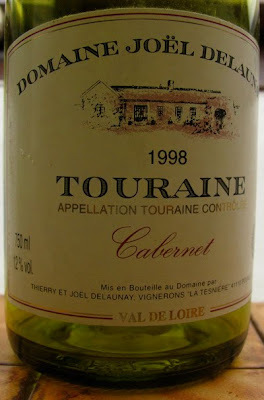 This was followed by the 1998 Cabernet from Joël Delaunay, which was very interesting to try after having tasted the 1999 the previous evening. The 1998 was also still showing well with some attractive fruit. A more difficult vintage it was more edgy and less soft and supple than the 1999. No reason, however, to feel that the remaining bottles need to be drunk up immediately. Should last another two or three years easily, although the lean structure may become more apparent. 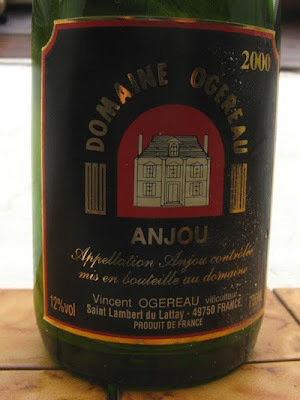 An Anjou Rouge from Catherine and Vincent Ogereau is made to drink fairly young as it is from many other Anjou producers with their Anjou Villages being more structure and designed to age. However, this medium weight 2000 Anjou is still drinking very well with soft black fruits and well integrated tannins. 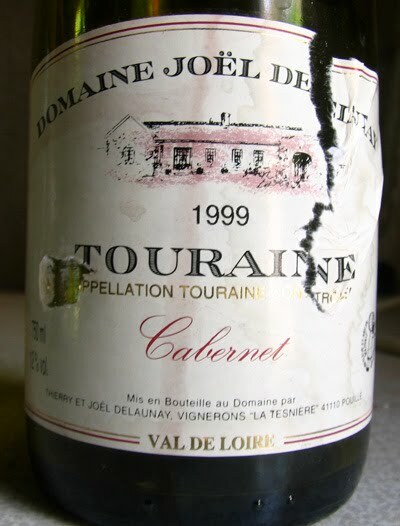 Like the Delaunay remaining bottles should happy continue to give pleasure for another two or three years or more. After the drive down yesterday from Calais a glass or so of Bruno's easy drinking Rosé was most welcome. Even though it was 2008 this Rosé has remained fresh and is not tired. 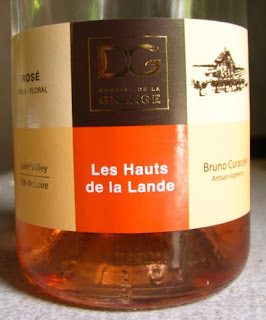 A blend of Cabernet Franc, Grolleau and Gamay Noir this is a rosé to enjoy rather than to analyse. Later I had a tasting sample of the 1999 Cabernet AC Touraine from Domaine Joël Delaunay, which had been opened the day before. Showing very well with soft, savoury fruit, this showed once again that Cabernets from the Cher Valley do have the capacity to age well, even though 1999 is no more than a good vintage rather than coming from a great year like 1996 or 2005. 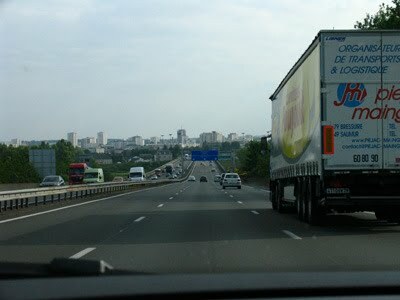 Now back in the Loire having travelled down from London today. 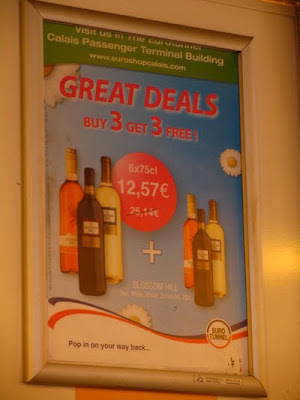 Buy 3 get 3 Free! an offer on Eurotunnel I can easily refuse! Although the Lebretons Domaines des Rochelles has long been known for the quality of their red wines, especially the Cabernet Sauvignon dominated La Croix de la Mission, their whites were less successful. That has changed with the arrival of Jean-Hubert, son of Jean-Yves and Anita. 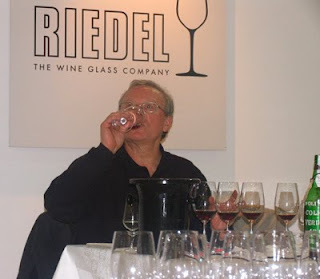 Jean-Hubert spent time in New Zealand and under his supervision the quality of the whites has improved considerably. 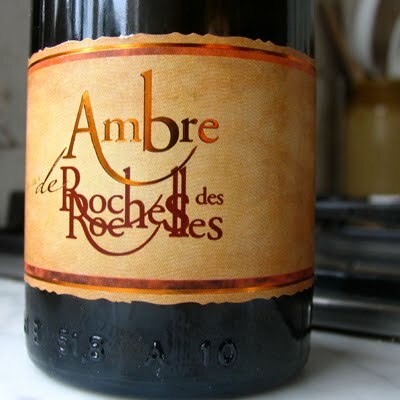 This rich 2005 Ambre de Roches des Rochelles, Coteaux de l'Aubance (50cl) is a good example with its opulent honeyed and apricot flavours nicely balanced by acidity in the finish, so that it is not cloying. It is particularly impressive as although the Lebretons have some very good terroir for producing reds, they are less blessed when it comes to sweet whites. A group being intronised into Les Bon Entonneurs Rabelaisiens, Chinon's confrerie in September 1992.I remember it was a long Sunday (avec modération, of course) and included tasting 1964 and 1947 at Couly-Dutheil – probably Clos de l'Echo – and also visiting another cellar and tasting other old vintage. 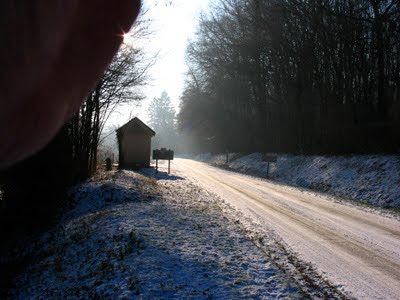 Sadly the details are rather hazy now – they may not have been that clear the next morning either. Although the photo is in colour my scanner seems to prefer black and white. This year the RSJ Restaurant in Waterloo is celebrating its 30th anniversary. This evening I came across the menu from the 10th anniversary dinner. 1947 Cabernet d'Anjou from Bablut to start with and a 1947 l'Aubance from Richou to finish with. 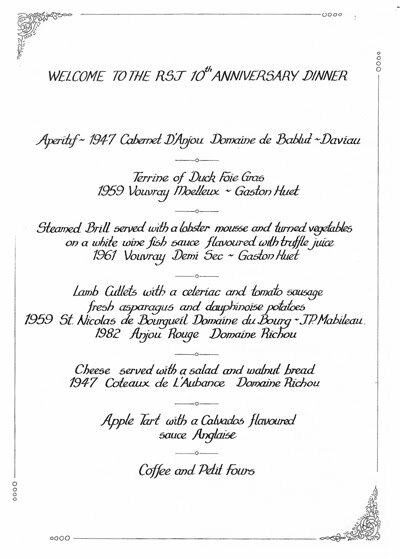 There was also an 1898 Bourgueil from Pierre Breton's grandfather that didn't make it onto the menu. I recall it being a pale wraith but memorable all the same. Probably the most unusual wine here is the 1947 Cabernet d'Anjou, a sweet rosé that ages remarkably well. At the time little red was produced in Anjou and the best Cabernet was reserved for this appellation, which could be demi-sec or moelleux depending on the vintage conditions. In 1947 it was definitely moelleux. 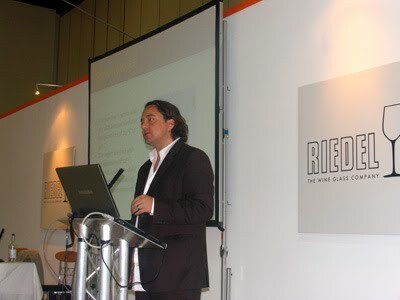 Jerémie Mourat was one of four young Loire vignerons over for last week's London International Wine Trade Fair. 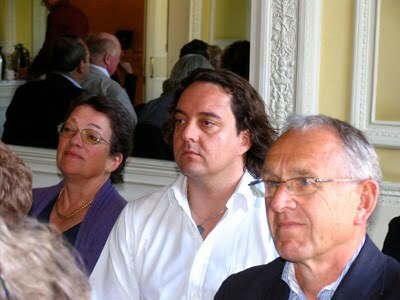 The three others were Jerémie Huchet (Muscadet de Sèvre et Maine), Jean-Hubert Lebreton (Domaine des Rochelles, Anjou) and Alexander Cady (Domaine Cady, Coteaux du Layon). 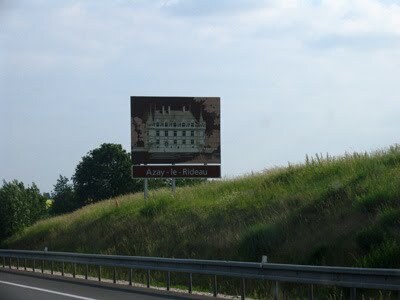 The four had a heavy responsibility looking after the veteran Loire courtier, Charles Sydney. Mourat Père et Fils (Château Marie du Fou) have 96 hectares of vines around Mareuil-sur-Lay in the Fiefs Vendéens. In addition Jerémie has 14 hectares of his own vines that he cultivates organically. Jerémie uses special egg-shaped vats to ferment some of his wines. 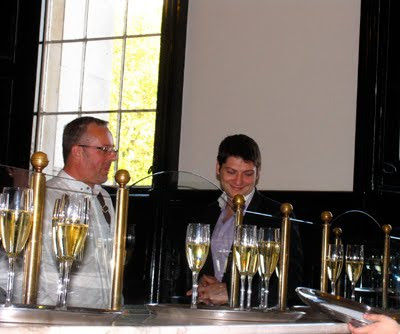 I started with the quite citric , lemony 2009 Collection – a equal blend of Chrdonnay and Grolleau Gris ( ) – with a touch of spice in the finish. Then the attractive 2009 Château Marie du Fou (70% Chenin Blanc; 30% Chardonnay), which is fermented and matured in 600 litre barrels with ripe mouthfilling fruit and good structure. Next a red – Collection Rouge which is a blend of 40% Pinot Noir, 30% Negrette (the Fiefs Vendeens is the only part of the Loire to grow this variety which is best in Fronton). This has good supple soft fruit, good length, some acidity and just a touch of greeness in the finish. 2009 Moratus from the organic vineyard is pure Pinot Noir – quite concentrated with rather edgy fruit. We finish with 2009 O.V.N.I. (UFO in English) – 90% Sauvignon Blanc with 10% Chardonnay with grassy Sauvignon aromas and nicely restrained on the palate with good length. 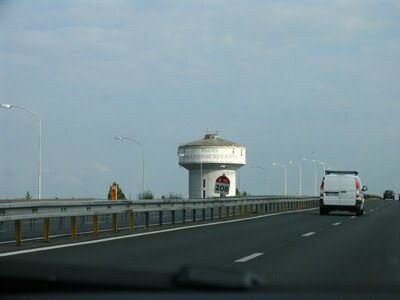 I can see that a trip to the Vendée is need both to visit the Mourats and revisit Thierry Michon. 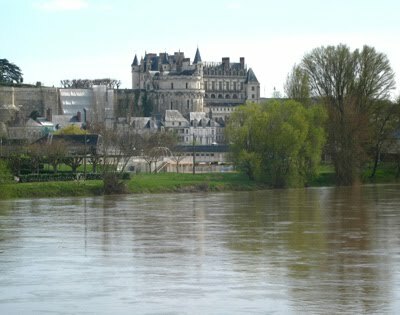 The summer edition of the Foire aux Vins d'Amboise will be held in the tunnel under the Château from 13th-15th August. Le SIAL China s’est tenu à Shanghaï du 19 au 21 mai derniers. 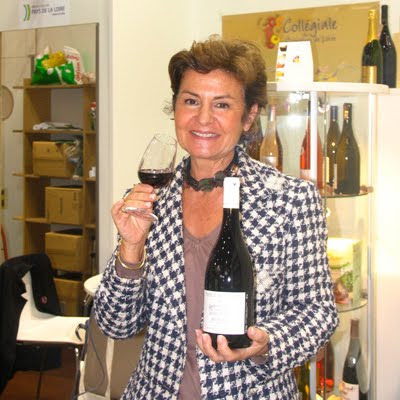 A cette occasion la Loire était représentée par des domaines et négociants, de Sancerre au Muscadet, ainsi que par les interprofessions du Val de Loire (Interloire et le BIVC) qui présentaient pour la première fois les vingt ambassadeurs 2010, vins sélectionnés pour représenter la région dans toutes les manifestations prévues dans l’année. 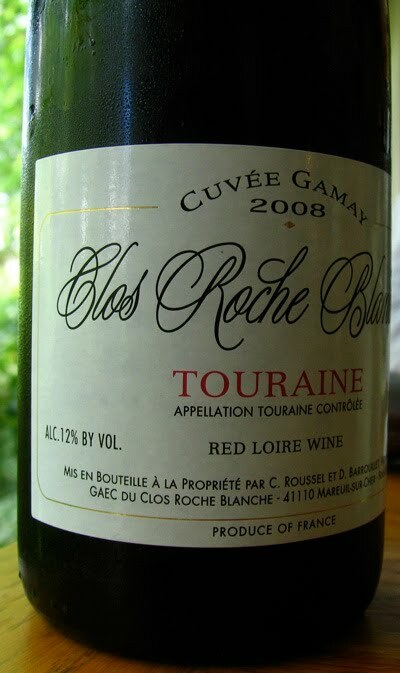 Deux vins de Loire ont été récompensés : le Touraine blanc 2009 de Paul Buisse a gagné un des « Best Buy China » dans la catégorie des vins blancs. Ackerman, Maison du Saumurois, a, pour sa part, obtenu un « Tendances et Innovations Trends » pour son X noir, fines bulles rosé. 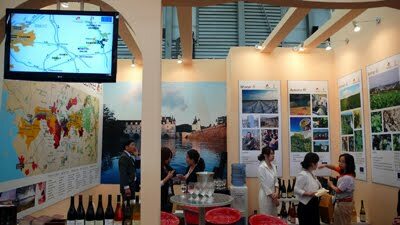 Depuis 2009, les Vins de Loire sont présents collectivement en Chine afin de se développer dans un marché en pleine croissance. 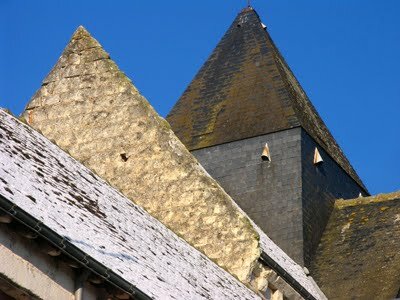 L’axe de communication est basé sur les Vins des Rois, la Loire étant particulièrement connue pour ses châteaux. Le programme s’appuie sur la découverte des caractéristiques des Vins de Loire, des appellations les plus connues aux vignobles les plus confidentiels. Des vins à boire jeune aux millésimes de garde, toute la production est mise en avant auprès des professionnels chinois très curieux de découvrir la troisième région viticole française. 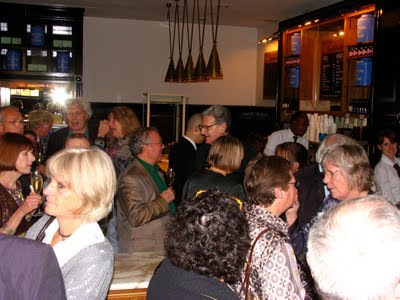 Pour 2010, relations presse, dîners et voyages de presse, wine training pour les professionnels et amateurs, espace Val de Loire au Musée du Vin de Qindao et un Loire Valley Wine Festival dans une trentaine de restaurant de Shanghaï, Pékin, Shenzen, Canton et Qindao. Réalisées dans le cadre du programme OCM, ces actions sont accompagnées par les Région Pays de Loire et Centre, principalement dans les mini-expositions Loire organisées en novembre et devant regrouper une vingtaine d’opérateurs ligériens. 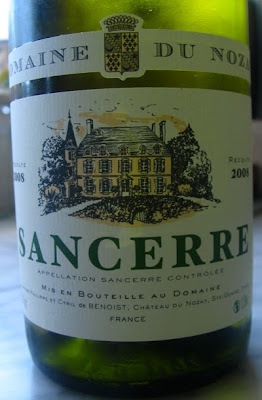 This characterful 2008 Sancerre (Corney & Barrow £13.99) comes from Sainte-Gemme-en-Sancerrois at the northern limit of the appellation. Produced by the Barons Philippe and Cyril de Benoist it has quite pronounced aromas of gooseberry and asparagus, mid-weight with the typical acidity and minerality of the 2008 vintage. 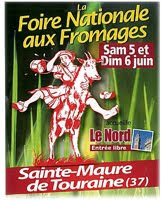 La foire 2010 aura lieu les 5 et 6 juin avec au programme : concours de fromages, expositions, manèges... La région invitée d'honneur sera le Nord. Pour plus d'informations, contactez le comité de promotion du fromage au 02 47 72 00 13. Cette page sera mise à jour régulièrement, n'hésitez pas à la consulter ! 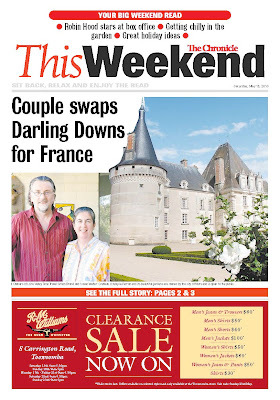 Full details and programme on here on the Sainte-Maure-de-Touraine site. Programme includes many musical acts including a country gig starting around 11pm on the Saturday. 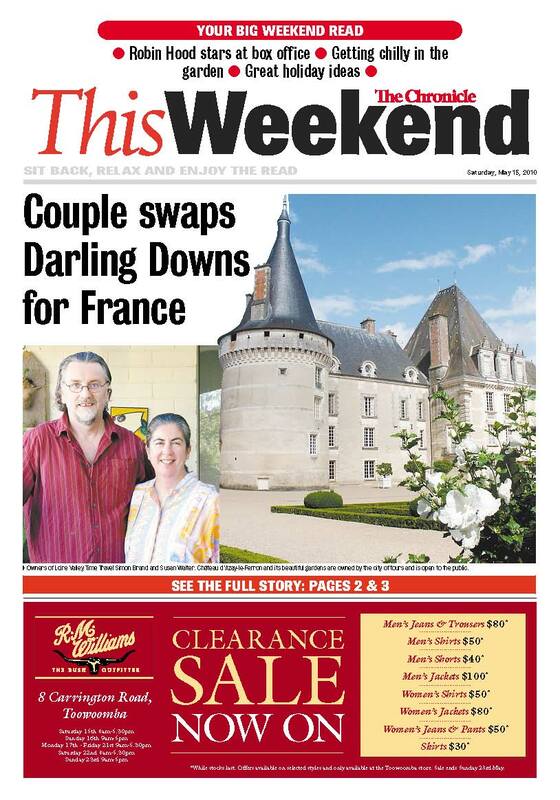 Australian couple Simon Brand and Susan Walter of Days on the Claise have recently had a feature published on them in the prestigious Toowoomba Chronicle (15th May). 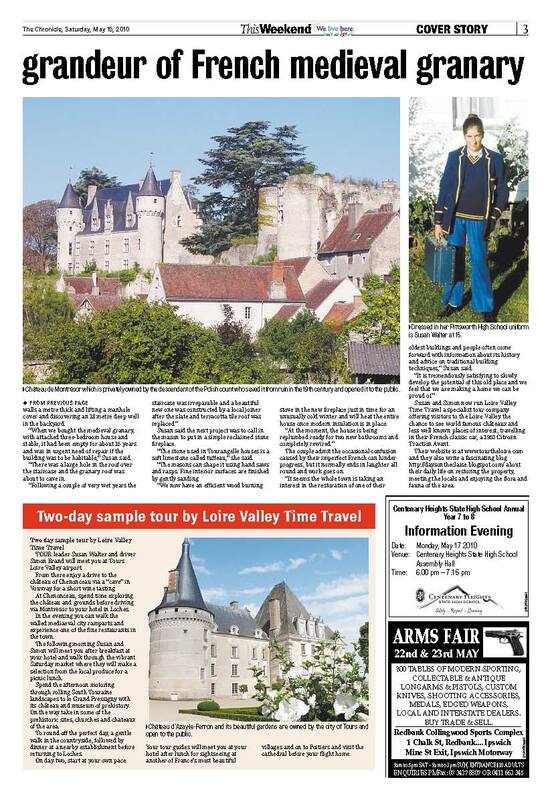 FORMER Pittsworth resident Susan Walter never imagined she would end up in an 800-year-old property and running a specialist tour company in France. And just how did a small-time country girl end up in a small country town on the other side of the world? Susan’s family moved to a dairy farm at Irongate, just outside Pittsworth, when she was 11 years old. After some years the farm was sold and the Walter family moved into a house in town, where her parents John and Ruth Walter still live. 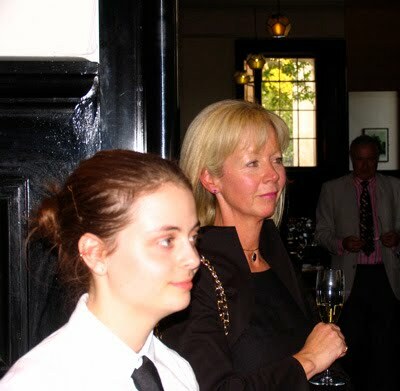 Susan studied for a degree in business and hospitality management. After living and working at the Sunshine Coast for a couple of years she returned to Pittsworth. During this time she established a reputation as a talented craftswoman, making quilts, costumes and embroideries. In 1996 she noticed an advertisement for a summer school at Manchester Metropolitan University in the costume and textile department. “I was unhappy in my job and unable to get the time off work to attend the workshop in England, so I resigned,” she said. “We put our furniture in storage, rented out the house and moved to London. Although Susan said it was very sad to leave, she saw it as an opportunity to go back to university to study field taxonomy, which is about conducting biological surveys of sites so the people who manage the environment know what species they have. Susan’s expertise is in lowland grasslands, flies, bumblebees, dragonflies, sedges and rushes, umbellifers (wild carrot, celery, parsley, Queen Anne’s Lace) and more recently terrestrial orchids. The couple also started looking around for a new home after living in London for 12 years. 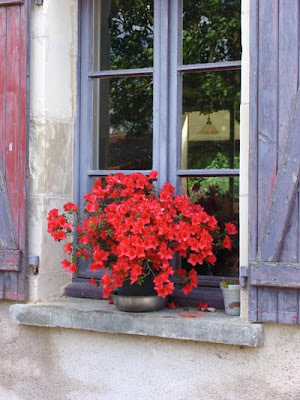 They bought a former grain merchant’s premises in the small country town of Preuilly-sur-Claise in central France in 2006 and then moved into the granary in May 2009. “We very quickly established friendly relationships with our neighbours and local businesses,” she said. 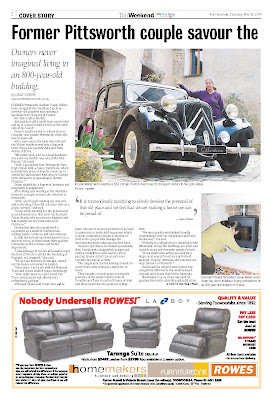 “Preuilly is a village that is remarkably like Pittsworth, except the buildings are older and made of stone and everyone speaks French. Susan said the ancient stone house was completely different to the weatherboard colonial style house they left in Australia. Challenges crop up every day such as passing electricity cable through solid stone walls a metre thick and lifting a manhole cover and discovering an 18 metre deep well in the backyard. “When we bought the medieval granary, with attached three-bedroom house and stable, it had been empty for about 15 years and was in urgent need of repair if the building was to be habitable,” Susan said. “There was a large hole in the roof over the staircase and the granary roof was about to cave in. Susan said the next project was to call in the mason to put in a simple reclaimed stone fireplace. “The stone used in Tourangelle houses is a soft limestone called tuffeau,” she said. “The masons can shape it using hand saws and rasps. Fine interior surfaces are finished by gently sanding. “We now have an efficient wood burning stove in the new fireplace just in time for an unusually cold winter and will heat the entire house once modern insulation is in place. The couple admit the occasional confusion caused by their imperfect French can hinder progress, but it normally ends in laughter all round and work goes on. “It seems the whole town is taking an interest in the restoration of one of their oldest buildings and people often come forward with information about its history and advice on traditional building techniques,” Susan said. 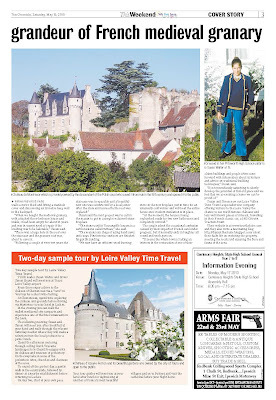 Susan and Simon now run Loire Valley Time Travel a specialist tour company offering visitors to the Loire Valley the chance to see world famous châteaux and less well known places of interest, travelling in their French classic car, a 1953 Citroën Traction Avant. 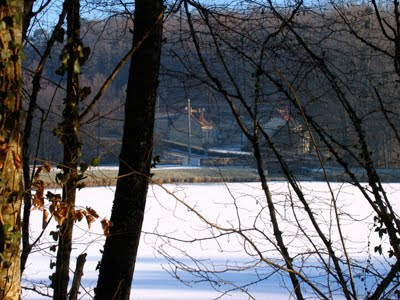 Their website is at www.tourtheloire.com and they also write a fascinating blog http://daysontheclaise.blogspot.com/ about their daily life on restoring the property, meeting the locals and enjoying the flora and fauna of the area. Vignerons et ville d'Amboise plantent une vigne afin d'assurer la promotion des vins locaux. Première récolte en 2012. En milieu de semaine, sous un beau soleil, les vignerons ont mis en terre les plans de chenin, sur un terrain appartenant à la ville et qui domine la cité. 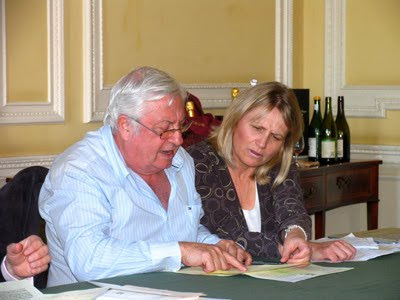 Première récolte à la troisième feuille, c'est-à-dire pour les vendanges 2012, explique Serge Bonnigal, président du Syndicat des vins d'Amboise. Mais avant, il faut planter la vigne. En milieu de semaine, ils étaient une dizaine de personnes sur le terrain des Châteliers, mis à disposition par la ville, pour planter les 21 ares de plants de vigne. Once again I have been spending time trying to arrange my photos in a more sensible order – a time consuming business! Anyway here are a few taken during the snowy spell in early January 2009. It is many years since I used to be a keen but pretty average amateur cycling time trialist but I have certainly been enjoying this year's dramatic Giro d'Italia. GazzettaTV has regular live streaming of part of every stage here – http://videochat.gazzetta.it/index_giro.shtml. Today is a very big mountain stage. Having rather foolishly left my notes behind in London when I headed north to Inverness on Wednesday, this report will inevitably be somewhat sketchy and lacking in detail. If I get time next week I will add another post. Jean-Hubert Lebreton (Domaine des Rochelles) was showing a number of red Anjou – mainly Anjou Villages but also the very attractive, juicy early drinking 2009 L’Ardoise. Amongst other reds I went through the 2008 range from Château de Minière (Bourgueil) once again showing the consistency of this property. Carine Simoneau (Antoine Simoneau) told me that they have started to till 10 hectares of their vineyards. This is good news as previously they have relied on weed killers. It will be interesting to see if they progressively abandon the use of weed killers. Previously the domaine’s strongest suit has been their Sauvignon Blanc but Karine told me that they are now working on improving their reds. Certainly the 2008 Cabernet was the best Simoneau red I have tasted so far with more concentration and riper tannins than in the past. They are not happy with their first Pinot Noir, which they made last year. Karine thinks it may be that the yield was a little too high. I also tasted a number of promising 2009 Muscadets from Henri Poiron, Manoir de la Mottrie run by Sébastien Duvallet and Alain Gripon, Bernard Chereau (Chereau-Carré) and Jerémie Huchet. 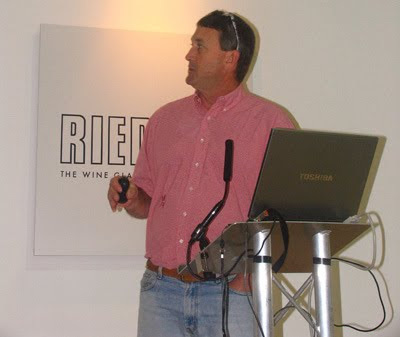 The organisers of the London International Wine Trade Fair give the Circle of Wine Writers the opening spot in the master class seminar programme. This year we decided that we should hold a tasting to raise money for three wine regions hit by recent natural disasters – so Chile, Madeira and Turkey. 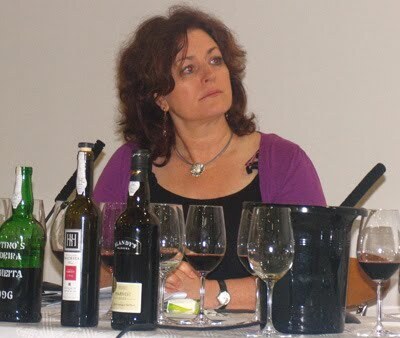 Each region had 30 minutes to present a range of wines. Charles Metcalfe kicked off with five Madeiras. Not the most logical order you might argue but our seminar started at 10am and Charles had a seven-line whip to be on the International Wine Challenge stand to help present the 2010 results. 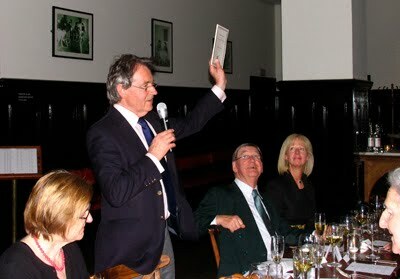 I very much doubt if there is a better wine presenter than Charles and his presentation was characteristically brilliant. Next up was Turkey with Susan Hulme MW and Daniel O'Donnell, winemaker for Kayra Wines in the Anatolia region giving a very good, quick overview of the developing Turkish wine scene. We finished with a fascinating presentation of the newly formed Chilean Carignan Club by Eduardo Brethauner, one of Chile's leading wine writers. Next posting will I promise be on the Loire. I'm presently operating on less than ideal conditions as I'm in a mild Inverness but without regular internet access. I have to keep crossing the road to the local pub which has free wi-fi access. So my apologies. 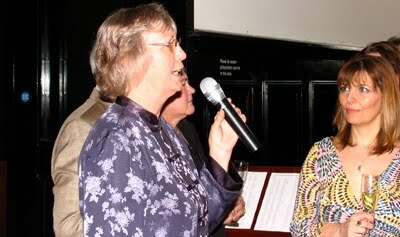 The annual Circle dinner this year celebrating the 50th anniversary of the founding of the organisation was held in the National Café, attached to the National Gallery in London. 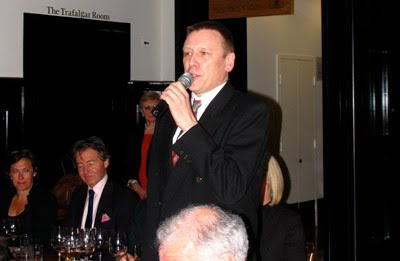 The wines were provided by the Union des Grands Crus de Bordeaux. My favourite was the 1996 Château Lynch Bages, Pauillac. 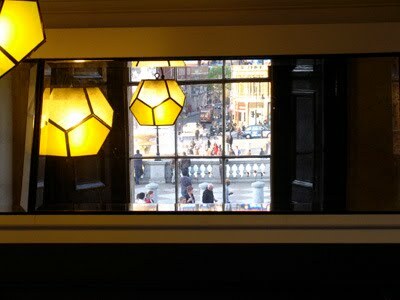 Trafalgar Square viewed through a window in the National Café. 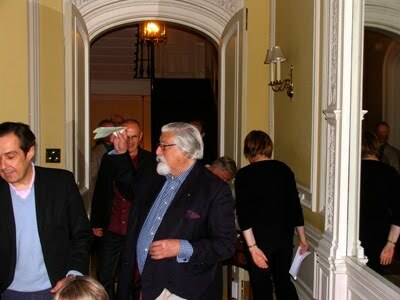 Circle of Wine Writers AGM: 50th year. 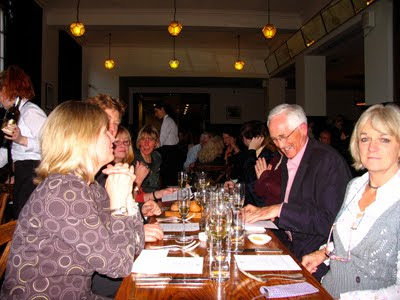 The Circle of Wine Writers was founded in 1960 in London by Cyril Ray. 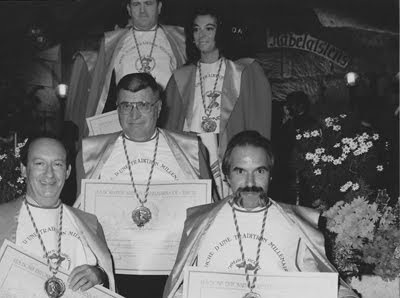 In a much changed world it now has around 275 members around the world and is probably the oldest association of wine communicators in the world. I have been the editor of the Circle's newsletter – Circle Update – since 1991. 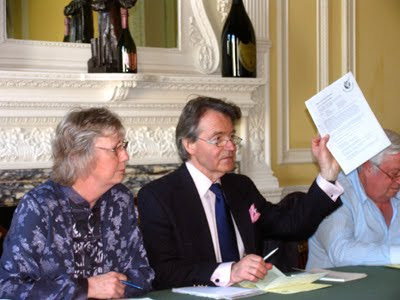 Here are some photos from the 2010 annual general meeting, which was held on Monday 17th May at the offices of Moët Hennessy in central London. During its 50 year history the Circle has had some exciting and controversial AGMs but this year was all sweetness and light. 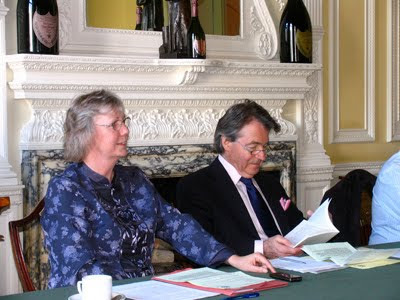 Stuart Walton was elected unopposed as the new chair of the Circle succeeding Julie Arkell, who is stepping down. 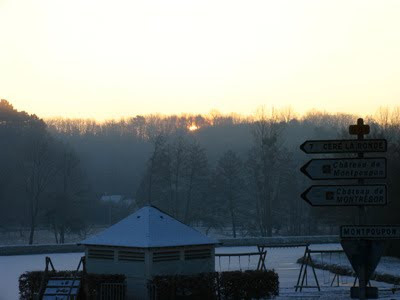 Just a weekend – Angers or Saumur or both? 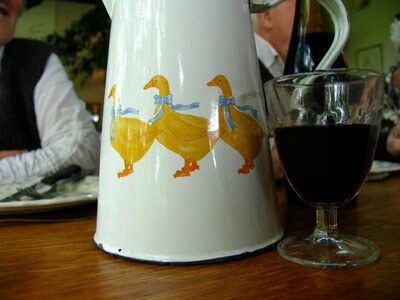 Wineries not to be missed?